From last six months, I and my family are going through a very difficult phase of life. I am writing this for my brother Nagendra Yadav. He is elder to me. From last six months, he is not keeping well. In June 2016, He came under attack of hepatitis (severe jaundice). Due to that, his liver got swelling. Due to swelling weight of liver got to increase. because of that, there was a huge pressure on the kidney. Both kidneys got damaged. His kidney stops working from the first week of December 2016. 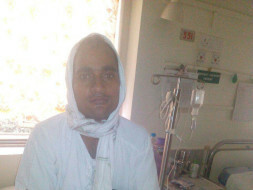 He was hospitalized in BHU Varanasi hospital. He is in critical condition. The doctor advised for the Kidney transplant within a year. As there is no facility of the Kidney transplant in BHU, Varanasi. 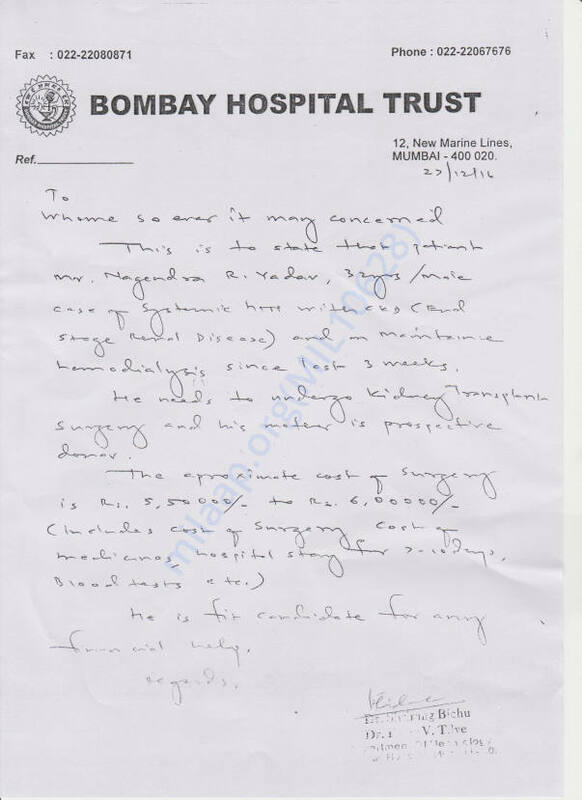 We came to Mumbai for the kidney transplant as there are many hospitals and we have some relative. Currently, we are leaving with our close relative in Mumbai(Kandivali). We have admitted my brother to Bombay Hospital Trust, 12, New Marine Lines, Mumbai in general ward Vide IP No.1625178, Bed Number 331, under Dr. Shrirang Bichu Observation. Currently, He is on dialysis. He is having dialysis on each alternate day. The doctor advised going under kidney transplant as soon as the possible maximum in a year as both kidneys are not working. We clear the one big hurdle of the kidney donor. My mother is ready to give the kidney. She passed the all the test in kidney matching and kidney profile. The doctor has given a green signal for transplant. Now the big issue is Money. As my brother was hospitalized since June 2016. We exhausted us all money in his treatment. Currently, we don’t have much money in hand. We are unable to support his Kidney Transplant operation. 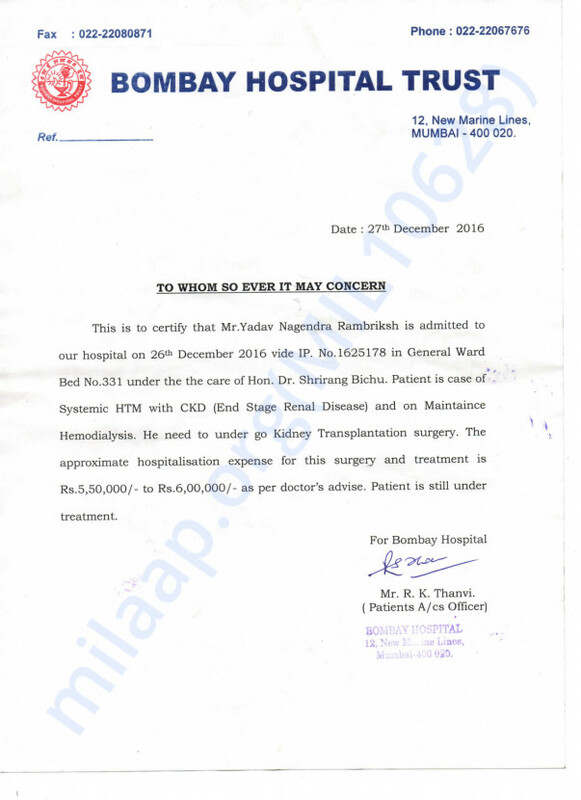 We need six Lakh rupees for Kidney Transplant operation. We are lower middle-class family so we don’t have BPL card to take any help from a government. I request everyone to extend whatever possible financial assistance to help us at this difficult time. Your support during this extremely tough time is appreciated so much. All donations will be used in the hope of giving him the best possible future, and the greatest chance of recovery. For any other details please reach out to me directly. I would be indebted and grateful for the rest of my life. Pankaj Singh Yadav, Kandivali, Mumbai-400101. He is good now. We need money for medicine now as they are pretty expensive please share in your networks.